How do you say QuickBooks integration in Spanish? 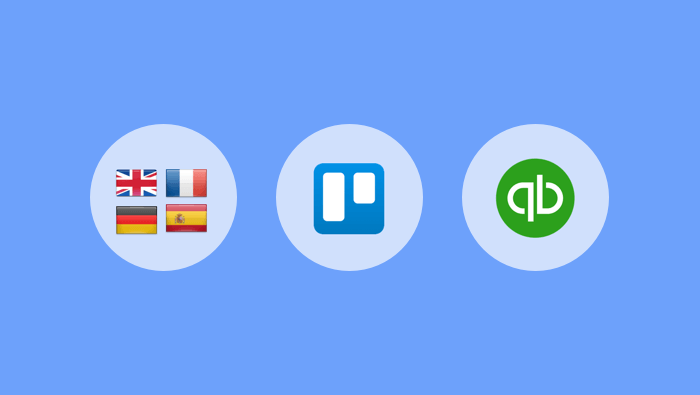 We’re happy to announce that you can now start using ActiveCollab in French, German, or Spanish! (BTW, support for other languages and Xero integration are underway). You can set the default language to English, French, German, or Spanish. They're officially supported, so they’ll always be up to date when new features are added. The default language for all users can be applied in the System Settings, but each user can override the default for themselves in their Profile settings. You can also change the language for invoices only (eg. you can use ActiveCollab in English but issue invoices in French). When creating a new invoice, you'll get the option to choose in which language you want to issue it. UPDATE: We added more languages so you can now use ActiveCollab in Dutch, English, French, German, Italian, Polish, Portuguese, Russian, Spanish, Swedish, or Turkish. QuickBooks is an accounting software geared mainly toward small and medium-sized businesses. It features business payments, bill management, and payroll functions. When you create invoices based on tracked time and expenses, QuickBooks will take over as your main invoicing engine. It’s a one-way process, so you won’t be able to edit the invoice in ActiveCollab anymore, nor will the changes made in QuickBooks be applied in ActiveCollab. To activate the integration, go to the Add-Ons section and authorize access to your QuickBooks account. For more information, see our help article. If you have some projects in Trello, you can now import them to ActiveCollab. Feel free to use the Column view like you used to, and enjoy all the extra features Trello doesn't have (like Gantt planning, time tracking, and invoicing). During the import, the newly added users won't receive the email invitation until you decide it's time - so you can safely import your projects and test everything out before inviting anyone. You can now download all the attachments with one click. We’ve redesigned creating projects and inviting people so it’s more intuitive. A notification is marked as read if a user replies to it via email. Files get uploaded instantly in the Files section (no need to click "Add Files"). A task's start date now appears as a filter, in Reports, and in the morning mail. Technical Information statuses in self-hosted are smarter and tell when something works or not. For bug fixes, minor improvements, and similar stuff check out the release log.